The women’s movement on a float. 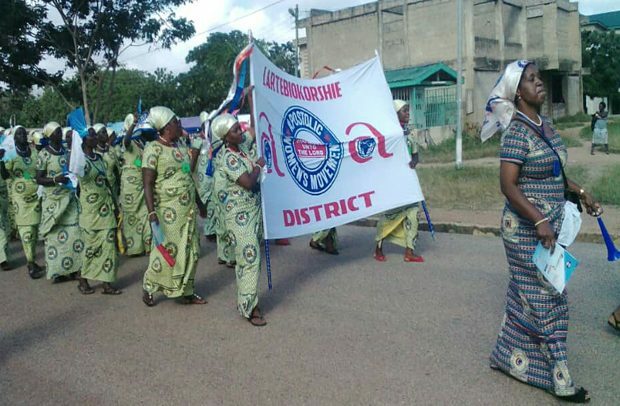 The Women’s Movement of the Apostolic Church over the weekend held their biennial convention, which was subdivided into regions. The Greater Accra Region was subdivided into five (5) administrative areas namely Kwashieman Sub, Achimota Sub, Mamprobi, Kaneshie and Adabraka. The newly created Kwashieman Sub-Area hosted the convention at the Odogornor Senior High School. The programme saw 8,000 women gathering at the Odogornor SHS compound for the convention. The church leadership and ushers had a hectic time finding space to accommodate the huge numbers. The occasion also saw the ordination of nineteen (19) ministers to the service of the Lord. The President of the Church, Apostle Peter Oko Mankralo, urged the newly ordained pastors to refrain from all forms of financial malfeasance and greed, advising them to fully depend on God to provide for them. The man of God further encouraged the congregation to seek the face of Jesus Christ in all their endeavours since that would lead to success in life. He added: “It is so worrying that many churches have sprung up with the intention of acquiring wealth rather than preaching the unadulterated word of God. Remember the church is not a place for making money but a place of sacrificial service”. He also made the whole congregation to understand that Jesus Christ is the light which has appeared unto all men, hence, the children of God have received the light and they must light up the path of the world so that the people of this world can know the true way.